Hemoptysis is the expectoration of blood that originates below the vocal cords. It is commonly classified as trivial, mild, or massive the latter defined as more than 200 – 600 ml in 24 hours. Massive hemoptysis can be usefully defined as any amount that is hemodynamically significant or threatens ventilation. The lungs are supplied with a dual circulation. The pulmonary arteries arise from the right ventricle to supply the pulmonary parenchyma in a low – pressure circuit. 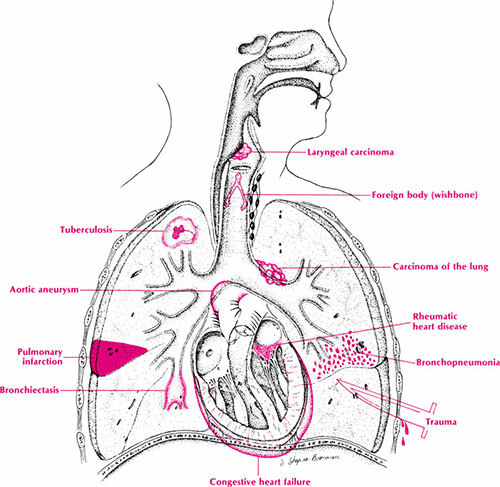 The causes of hemoptysis can be classified anatomically. Blood may arise from the airways in COPD, bronchiectasis and bronchogenic carcinoma; from the pulmonary vasculature in left ventricular failure, mitral stenosis, pulmonary embolism, pulmonary arterial hypertension, and arteriovenous malformations. Blood-tinged sputum in the setting of an upper respiratory tract infection in an otherwise healthy, young nonsmoker does not warrant an extensive diagnostic evaluation if the hemoptysis subsidies with a resolution of the infection. Elevated pulse, hypotension, and decreased oxygen saturation suggest large-volume hemorrhage that warrants emergent evaluation and stabilization. The nares and oropharynx should be carefully inspected to identify a potential upper airway source of bleeding. Diagnostic evaluation includes a chest radiograph and complete blood count. Kidney function tests, urinalysis and coagulation studies are appropriate in specific circumstances. Nearly all of these patients are smokers over the age of 40 and most will have had symptoms for more than 1 week. High-resolution chest CT scan compliments Bronchoscopy reveals endobronchial cancer in 3 -6% of patients with hemoptysis who have a normal chest radiograph. Patients should be referred to a pulmonologist when bronchoscopic evaluation of the lower respiratory tract is required. Patients should be referred to an otolaryngologist when an upper respiratory tract bleeding source is identified. To stabilize bleeding process in patients at risk for or experiencing massive hemoptysis. To correct disordered coagulation .